System analysis and design is key to any business or company. As it deals with data and information, it is integral to the procedural matters of each one. A business or company could not aspire to perform well without efficient data management. With the ever-increasing advances in technology, and with its core role as backbone to the success of businesses, the need for competent systems analysts has been on a steady rise. 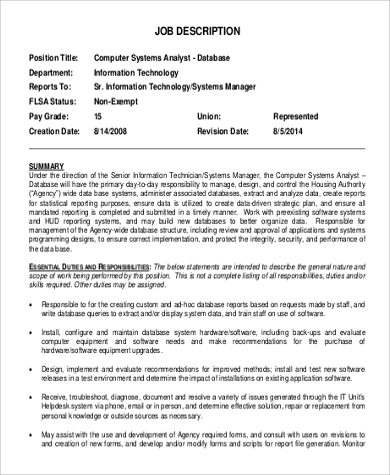 In general, a systems analyst deals with the IT of businesses’ various procedures. 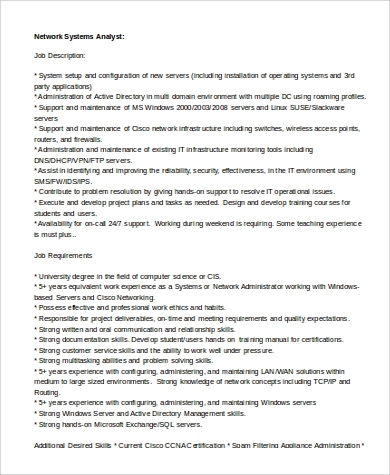 Hiring an effective systems analyst is thus imperative so as to achieve success in this regard. 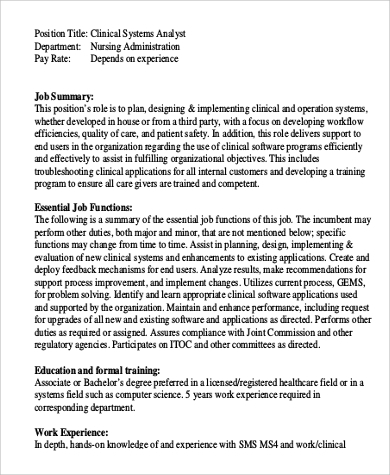 For a general guideline on presenting job descriptions to prospective employees, see these Job Description Samples. Every business or company holds vital data and information. Essentially, these are what they basically run on and work with. 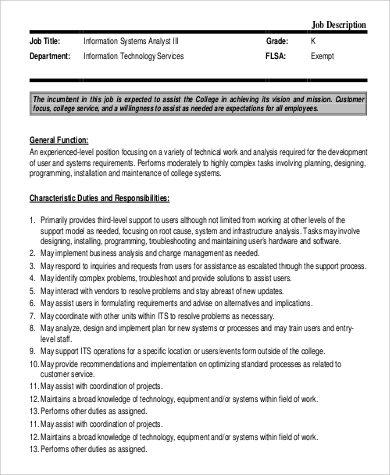 Dealing with all of this technicality is what a systems analyst is thus concerned with. 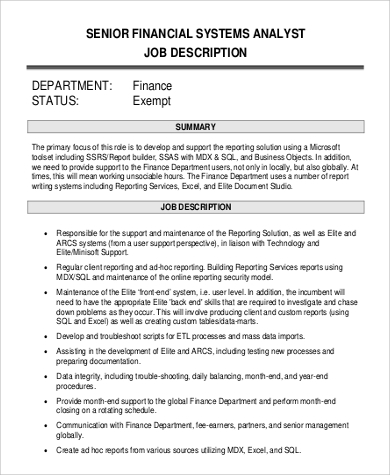 Like financial managers, as in these Financial Manager Job Description Samples, a systems analyst deals with the nitty-gritty of businesses. The job should provide invaluable support to the entire company, by seeing to the management of data and information that are used by all of its various branches and sectors. Productivity and success to their line of work yields to these branches and sectors’ effective performance as well. A systems analyst creates the software and organization upon which the entire company relies on. Data and information are kept, recorded, and exchanged according to the structure provided for by the systems analyst. Constant surveillance of the IT structure should continually be performed by the systems analyst. He or she should assess whether it is still responding well to the procedural needs of the business. If the existing design is still apt to the effective performance of the various branches and sectors within the company, the systems analyst should constantly check and determine. A systems analyst should also come to the aid of various technical concerns and issues that the entire system may come across. Further, he or she should be on the pulse for various systems modifications necessary. 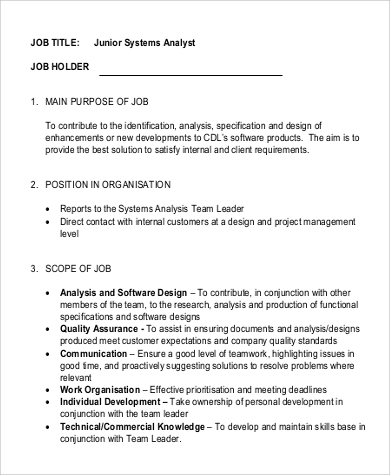 A systems analyst should be able to determine whether new technological developments could be incorporated into the existing structure in use by the company.The very rationale for all these responsibilities of a systems analyst is to ensure that the business or company’s procedures are constantly done effectively and efficiently with the IT structure that he or she has designed. 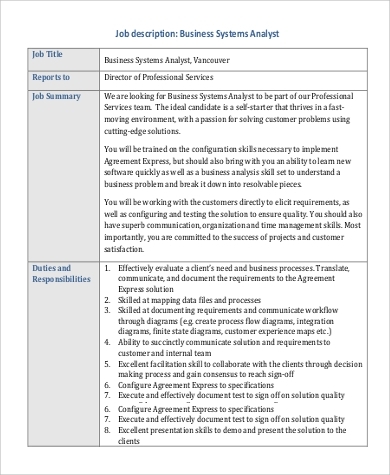 These samples show job descriptions of systems analysts for various types of businesses. This further proves that systems analysts perform important functions in companies. 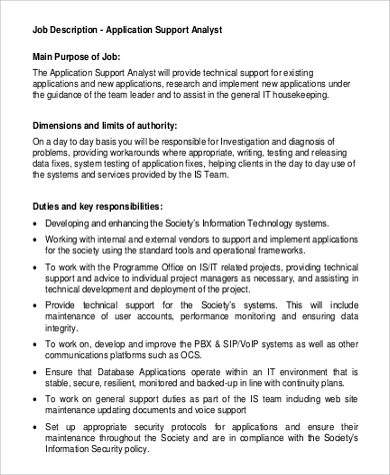 For the job descriptions, list the duties and responsibilities of the needed systems analysts, specific for whatever the type of company or industry. 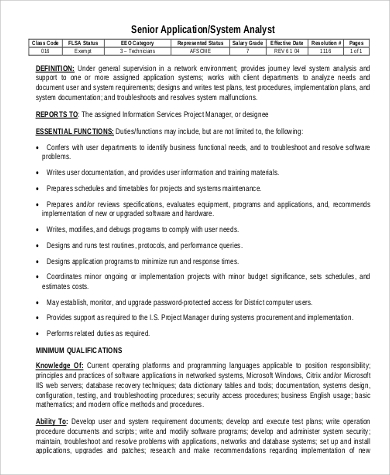 At the other end, if you wish to take on a position as a systems analyst, here are Sample Data Analyst Resumes to guide you with your application.